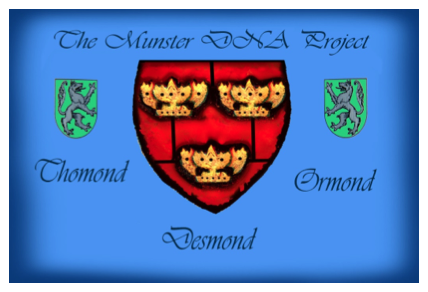 One of the most popular talks at this years GGI2013 was The Munster Irish DNA Project presented jointly by Elizabeth O'Donoghue / Ross, Nigel McCarthy and Finbar O Mahony. The good news is that the slides from this excellent presentation are now available for download from Elizabeth's profile page or simply by clicking here. The YouTube videos of the presentations are proving to be very popular indeed and even though it is only 6 weeks since the event took place, they have been viewed a total of 3000 times for 37,500 minutes (that's 625 hours). 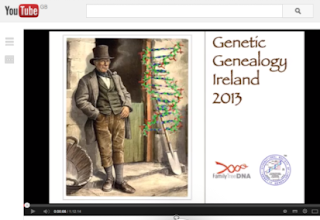 The YouTube Channel is simply called Genetic Genealogy Ireland and you can access it here. And if you're stuck for a Christmas present for someone, why not take advantage of the FTDNA Christmas sale. This goes on until 31st Dec and they usually extend it for a few days into the New Year. The Y-DNA-37 test is only $119 (usual price $169). The Family Finder test is it's usual price of only $99, but, if you live in the US, you also get a free $100 gift card for use at Restaurant.com!